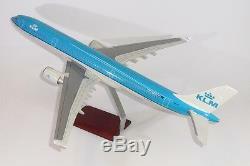 Premium Models 1/100 Scale KLM Royal Dutch Airlines Airbus A330-300 Registration #PH-AKA Solid Resin Desk Top Display Model Airplane With Wood & Metal Stand Item #PA071. Brand New In Foam Padded Box. Painstakingly built from polyurethane resin by skilled craftsmen, with a wealth of detail have hand-carved & hand-painted each model airplane, with great concern for exact accuracy. 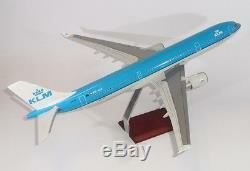 The model airplane measures 24.75" in length, has a 23.00" wingspan. 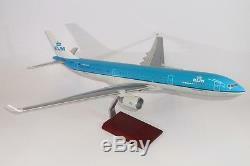 The item "KLM Airbus A330-300 PH-AKA Desk Top Display 1/100 Jet Model Aircraft AV Airplane" is in sale since Tuesday, March 28, 2017. 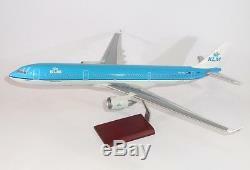 This item is in the category "Collectibles\Transportation\Aviation\Airlines\KLM". The seller is "bordi20" and is located in Aalsmeerderbrug.